Are you fed up with the rain streaming down your patio doors or new bi-fold doors? If they’re made of wood, you’ve experienced the results of the frames swelling and causing them to jam. A door canopy fitted over any doorway will protect the doors from any rainfall running down the wall onto the doors. 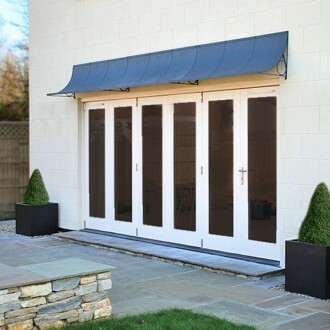 If you have a wide set of bi-fold or French doors, we can make a canopy to fit over them. Any width can be made to measure to ensure that the proportions are correct for your doorway. The canopies are not only good at preventing rain running down the doors , but also help to screen direct sunlight in summer especially over South and West facing doors. Call us today on 01225 851577 for a quotation.